Varytale is a platform for interactive stories that fall somewhere on the spectrum between stateful CYOA (like Choice of Games) and quality-based narrative (like Echo Bazaar). As you can see from the screenshot, the experience is intentionally booklike and lushly textured. Varytale borrows or improves on the attractive qualities of Undum. There are visible stats if the author wants them (or else not). Choices can appear as links embedded in the text or a list of options immediately following it. You can keep track of your place in a book with one or several bookmark ribbons, which grow longer over the cover of your book the more you’ve read. I haven’t gotten very deeply into Fighting yet, but How to Read is a tidy, brief introduction to how to use Varytale and is likely also to be interesting to anyone thinking of writing Varytale books in the future. Hymn and Shanty is more like interactive poetry, allowing the player to choose stanzas to add to a song. There’s also a growing collection of reader-submitted stories. Bee is a new work of mine, written for Varytale: it’s the story of a home-schooled girl preparing to compete in the national spelling bee, dealing with various small crises with family and friends, and gradually coming to terms with the clash of subcultures involved in belonging to a family like hers. It’s fascinating to me, how the family dynamics and cultural dynamics–and the growth of the main character–weave in and out with the concentration on learning how to spell strange and unusual words. The protagonist has a distinct personality, but the choices she (well, you) make are constrained and opened both by earlier choices, and cultural indoctrination, and all sorts of other things. And it often comes back to spelling: as a concentration tool, a mode of defiance against parents, a meditation on spiritual matters. There’s quite a bit to say about the Varytale authoring tools as well: unlike its predecessor Undum, Varytale offers a fairly significant set of tools for putting a book together. But I’ll save that for another post. Edited to add: some additional comments on Metafilter, Free Indie Games, IFDB review, Gamespite thread. 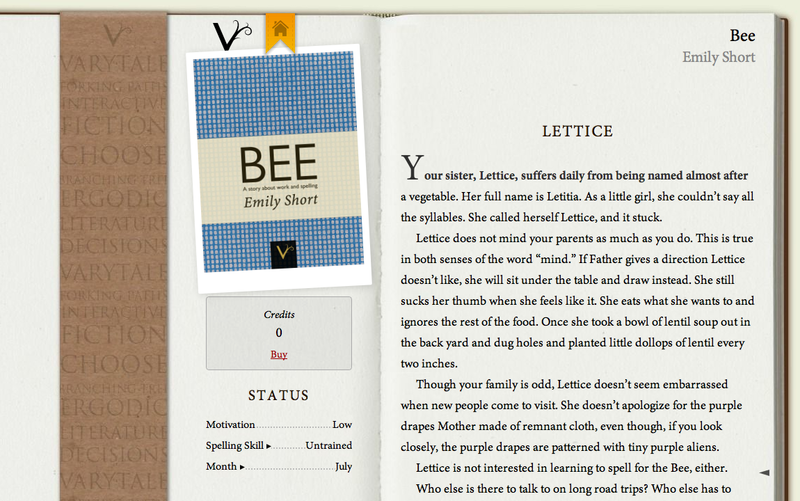 This entry was posted in announcements, CYOA, interactive fiction and tagged popular, varytale by Emily Short. Bookmark the permalink. I came across this story through a random link (although I have played and enjoyed several of your interactive fiction pieces before), and I’m really enjoying it. I can’t figure out how to disable the action meter, though. I’d like to be able to run the story without waiting in ten-minute increments. The delays also hamper my ability to check different actions and see how they affect the story without penalty. Can you help point me to the version without the action meter? Thank you! Action metering on Bee should be turned off universally now — it’s a book-wide setting, not a per-reader setting. (Sorry if I explained that poorly.) So if you’re still seeing a metering feature, maybe try reloading to clear your cache? I know I had some features on the authoring side that weren’t updating for me even though a new build had been pushed, until I did something to clear it. If that doesn’t work, I’ll try to see what Varytale support can do for you. When I reloaded the page, the meter was gone. Thank you, and thank you for the book! I played pretty far through the story and then tried to click on another link on the site, which took me to a new page. I couldn’t navigate back and continue where I had left off. I didn’t log in with facebook because I don’t have one. Will there be a way to save progress without facebook? …and that one of the major things they’re hoping for is feedback from readers about their experience. So I encourage responding there. That was really fun. I have a question though. Is it possible to win the national spelling bee? I played through twice. The first time I tried hard to keep a good relationship with my parents and sister while taking every opportunity to study my spelling and keep my motivation high. I placed second. I knew the final word without having to ask for a hint because it’s in a language I speak. The next time I played through I tried exploring options I hadn’t taken the previous time. Whenever there was an option I had chosen differently the previous time, I chose a different way, which had the effect of being annoyed with my sister and parents and getting to know Jerome better. But I still paid attention to learn spelling words and getting my skills up to an elite level. When I got to the end, I asked about the origin of the word, even though I knew it, before choosing the correct answer, and I still placed second. But rereading the opening page, I’m wondering if second is as high as you can get in the competition? If there is a way to win the competition, then I’ll replay a few more times and try to figure it out, but if there isn’t then I won’t. Lrc, gung’f rknpgyl evtug: lbh pna’g npghnyyl jva. Nyy lbh pna qb vf punatr lbhe rkcrevrapr bs ybfvat, naq jung vg zrnaf. V, hu, qvq gel gb jnea crbcyr. That makes a lot of sense. Thanks. V znl ercynl naljnl, whfg gb ybbx nebhaq fbzr zber. I played through Bee, and on the whole loved it, but I suspect that it didn’t work quite right for me. After a while Mom went back to work and then suddenly found myself in the epilogue and got to choose an ending. One of the endings talked about placing second at the national competition; but I hadn’t been to the national competition. And once I picked an ending I got returned to the epilogue and was allowed to pick a different ending, which didn’t seem to ring true with the rest of the game — was this intentional? That does sound like you ran into a bug. Thanks for the report — I’ll look into it and see what I can do. A couple of typos caught my eye, probably because I was thinking about spelling: born for borne, and aspirants for aspirates. I think what I liked best about Bee is that all the conflicts in the story seem to arise from interactions among people of good will who hold different sets of beliefs. Seeing the characters talking to one another at cross-purposes made them seem the more real to me, and made me want to see what I could do to resolve the tensions between them. Thanks for the reports — I’ve already stomped a couple of bugs to do with segments being available after they should have been exhausted, but it looks like there are more to do. Much appreciated. Hugely original concept, Emily. I’ve been having a lot of fun. However, I think I may have run into a bug as well, unfortunately. I got through to the national completion and placed second, but I’m now presented with a blank right-hand panel. The left hand panel looks as I would expect it to – including the month being ‘Second place’. :) There is no main text and no choices to make, though. Ah, hm. That sounds like a bug also, but probably a cosmetic one: you are, at that point, done, and it’s failing to show you a neat “the end” message. Need to fix this also, to be sure, but you may not have missed any content. Oh, okay, I wondered about that. That said, David Given’s discussion of endings and epilogues above leaves me thinking I might have missed something…? I ran into the same problem and I’m dying to see the epilogue. :( Absolutely loved the writing in this though. I played it on an iPad and saved a whole bunch of sections as screenshots because the writing was so lovely. I love this, although I hit the same bugs as mentioned. I also note it seems really, really hard to get close to Jerome or find out more about what’s going on with Mrs. Barron – in one playthrough I got Mr. Barron discussing her suicidal habits, and one option of being able to think about a boyfriend while in Isolation, but I was never able to get those back again in other playthroughs, even if I followed what I did before. Is there a particular method to getting more of either of these plots? Additionally, what have you done to encrypt your above comment to Z? I had the same question and would kind of like to able to see what you replied. You can never get to the point where you’re actually dating Jerome: your families are too conservative and you’re both too young for that to be an option. But you can get to be pretty good friends with him and his sister. I’ll play through a few more times and see whether that’s more difficult than it’s supposed to be. Re. Mrs. Barron, I had a look at the structure, and you’re right that it was trickier to trigger some of the plot developments than I had really intended it to be. I’ve gone back and adjusted some elements, so that there are now a couple of different possible ways to kick off that subplot. I’ve now tweaked so that you should get exactly one epilogue in each case, no more and no less. If anyone does run into a situation where that’s not the case, do go ahead and let me know, because it will mean there’s still some stuff to be worked out under the hood. The game just crashed — showing only a blank screen on the right side of the page — after I gbyq Zbgure gung Yrggvpr jnfa’g zvforunivat. I can’t figure out how to continue that iteration of the game. This is the second time I’ve hit a blank screen and lost the game, but I didn’t write down the circumstances of the previous crash. Also, in the left corner of the screen, the game reads Month: Second Place , but I’d passed the district championship and was in the middle of the second academic year at that point. Gahh aha. Okay, I have figured out what was doing this and I think fixed it. Do you still have a bookmark at that point from which you’d like to recover? There’s something a little bit hacky I could do that should give you the opportunity to recover your playthrough and go on from where you are, but I won’t bother if you’ve already given up / restarted / whatever. I just played and I think I’ve reached all three endings. The epilogues are all working now :) Really great job and I’m happy I got some happy endings! 1) At one point, I looped the german loan words until I ran out of motivation, and my motivation stat read ‘-1’. Not sure if that’s intentional. 2) Ng fbzr cbvag va gur sbhegu lrne nobhg n zbagu orsber V jrag gb Angvbanyf zl zbagu fgng fgnegrq ernqvat ‘Va Gur Jbeyq’, naq fgnlrq gung jnl hagvy V tbg zl raqvat. Thanks for the feedback. The German Loan Words thing I’ve just vastly simplified, because it wasn’t working the way I intended in many respects. I haven’t gotten to the other issue yet, but I mean to do so. I quite enjoyed it (especially trggvat zl unve phg n frpbaq gvzr – I will likely never forget that scene). I was never sure if re-revising the same words was actually making me any better a speller, though, or if I was to aim for variety and spend the rest of my time having fun/causing chaos. I still did it sometimes out of anxiety that I should be doing something. WTF is this? trggvat zl unve phg n frpbaq gvzr I don’t know what you guys are posting these parts. I followed this blog because i thought that gibberish would turn into English, but that’s obviously not working. I want to know what you guys speaking! I feel like I’ve become schizophrenic. Well, if you feel that you are becoming schizophrenic, you should definitely see a doctor promptly. It’s pretty serious business that can ruin your life if you don’t have decent treatment and a solid support network to have your back. The gibberish you’re confused about is ROT13, a simple rotational cipher that’s often used in certain online social circles to hide spoilers so that casual readers don’t get spoiled just by scrolling through. You can run it through rot13.com to automatically decipher it, or try to decipher it on your own for fun. Thanks for the answer. Finally, could read those responses.